July 17, 2015 – The Quintuplet Cluster gained its name due to its five brightest stars, but it is home to hundreds more. The cluster is located close to the Arches Cluster and is just 100 light-years from the center of our galaxy. The cluster’s proximity to the dust at the center of the galaxy means that much of its visible light is blocked, which helped to keep the cluster unknown until its discovery in 1990, when it was revealed by infrared observations. Infrared images of the cluster, like the one shown here, allow us to see through the obscuring dust to the hot stars in the cluster. The Quintuplet Cluster hosts two extremely rare luminous blue variable stars: the Pistol Star and the lesser known V4650 Sgr. If you were to draw a line horizontally through the center of this image from left to right, you could see the Pistol Star hovering just above the line about one third of the way along it. The Pistol Star is one of the most luminous known stars in the Milky Way and takes its name from the shape of the Pistol Nebula that it illuminates, but which is not visible in this infrared image. The exact age and future of the Pistol Star are uncertain, but it is expected to end in a supernova or even a hypernova in one to three million years. 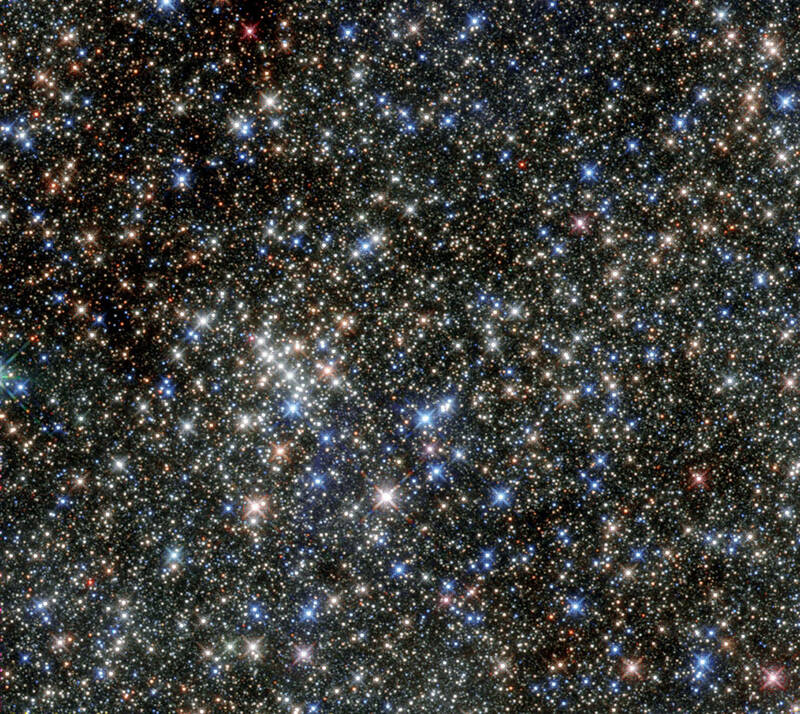 The cluster also contains a number of red supergiants. These stars are among the largest in the galaxy and are burning their fuel at an incredible speed, meaning they will have a very short lifetime. Their presence suggests an average cluster age of nearly four million years. At the moment these stars are on the verge of exploding as supernovae. During their spectacular deaths they will release vast amounts of energy which, in turn, will heat the material — dust and gas — between the other stars.